Gregorio Escalante Gallery is excited to announce its upcoming solo exhibition with Danish artist, designer, and muralist Mikael B. A pursuit of passion and an exploration of new worlds, Reality Shift eveals the artist’s process through drawings, prints, paintings, and a new mural at the gallery. Everybody dreams. Everybody strives to get lost and find themselves, to find their purpose in this life, but we ultimately make the distinction between what is realistic and what is idealistic. Mikael B. refuses to make this distinction, continuing to grow into the passionate young artist that he is today. From graphic design to wildstyle graffiti to his latest abstract dreamscapes, his oeuvre of work is constantly growing, changing, and challenging itself to create new, wild worlds where anything is possible. Mikael B. established his own successful design agency in 2008, fusing his background in graphic design with more artistic elements to create new brand identities for his clients. 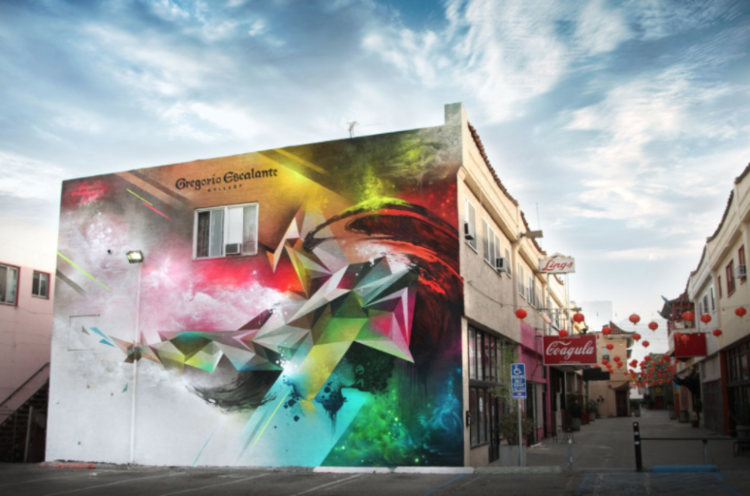 In 2014, he chose to dedicate himself to his art practice, establishing a signature aesthetic that combines graphic elements of wildstyle graffiti with bold colors and geometric forms. His work is unbound, unrestricted, flowing across genres of urban contemporary, fine art, and graffiti to create alternate realities and new universes within each piece that he creates. After opening his sold-out solo show in Denmark, Mikael B. is making his mark in Los Angeles with Reality Shif. This latest body of works sees a westward influence in the color palette and creation – somber tones of rich browns, dark blues, and neutral grays contrast with vivid neons and bold geometric shapes. His canvases leave more negative space amongst the graceful clouds and painterly brushstrokes, allowing us space to challenge ourselves to let go while quietly encouraging us to believe that this quixotic moment can be our reality. Reality Shift will be on view at Gregorio Escalante Gallery from July 15 through August 20, 2017. There will be an opening reception from on Saturday, July 15 from 7-10pm in addition to regular gallery hours.